Dutch fishing company Ekofish Group has contracted Damen Maaskant Shipyards Stellendam to build a new twin-rig fishing trawler, specially designed to support eco-friendly fishing. SSI client Vripack will be using SSI’s ShipConstructor software for design and engineering work on the vessel. Ekofish is famed for its continuous innovations in regards to sustainable fishing. Ekofish gives the utmost attention to the processing and storage of the fish including the highest standards of hygiene and cooling. High standards are also what naval architect Vripack is known for. 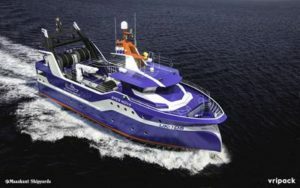 Vripack has brought the quality of its yacht design experience to the design of its first twin-rigger fishing vessel. Using a holistic approach, it closely collaborated with both Ekofish and Maaskant Shipyards to create a practical, yet innovative design. The boat will be built using super-efficient manufacturing techniques, enabled by sophisticated design and sophisticated software. Vripack utilizes SSI’s ShipConstructor software to execute an extremely high detail 3D engineering process which massively simplifies construction. Metal production times are reduced by hundreds of hours, standard profiles replace CNC profiles and the builders are able to pre-assemble units more quickly and accurately. Their approach is empowered by ShipConstructor’s smart way of storing information in a Marine Information Model (MIM) which automatically keeps all associated drawings up to date. This, along with tightly integrated technologies such as Autodesk Navisworks, enables all stakeholders to communicate effectively and efficiently.